I have some pretty lofty goals in life, both financial and otherwise. I like to dream and dream big! Sometimes a dream is just that, it’s a fleeting thought but nothing really comes of it. Other times a dream can be turned into a goal and, if I work at it, can become a reality. I am sharing with you how my husband and I set goals, specifically financial goals, and stick to them. Financial goal planning has been instrumental in keeping us on track especially living on one income. 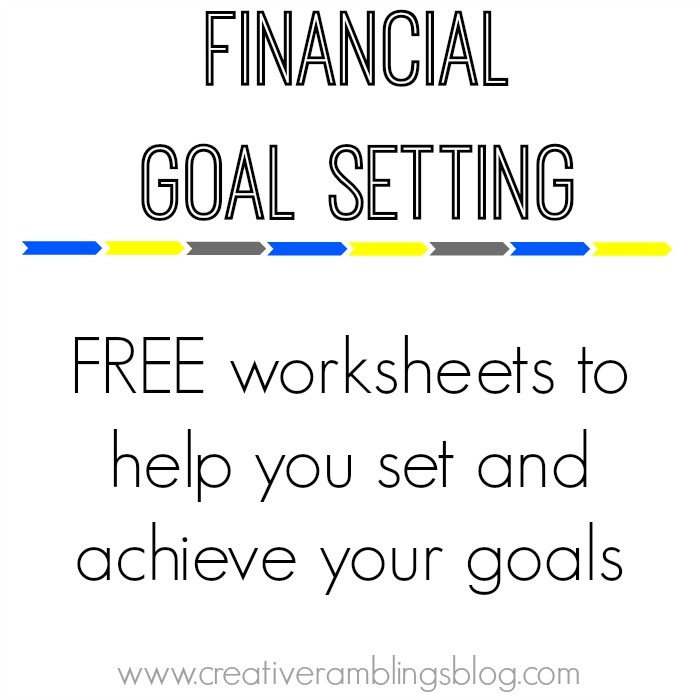 I have included some worksheets that will help you work through the process and identify real ways you can work towards your financial goals. If you do not have a goal, then what is motivating you? Probably nothing. So, take some time to contemplate exactly what you want to get out of life, where you want to be down the road. It might take you a few weeks if not months to fully sort this out. It is time well spent though. If you are married make sure to recruit your significant other in this process because otherwise you are very likely going to fail. When setting a financial goal think big, but not crazy big. Be specific about the time frame as well. The key is setting reasonable goals and breaking them into achievable chunks so as not to get overwhelmed. 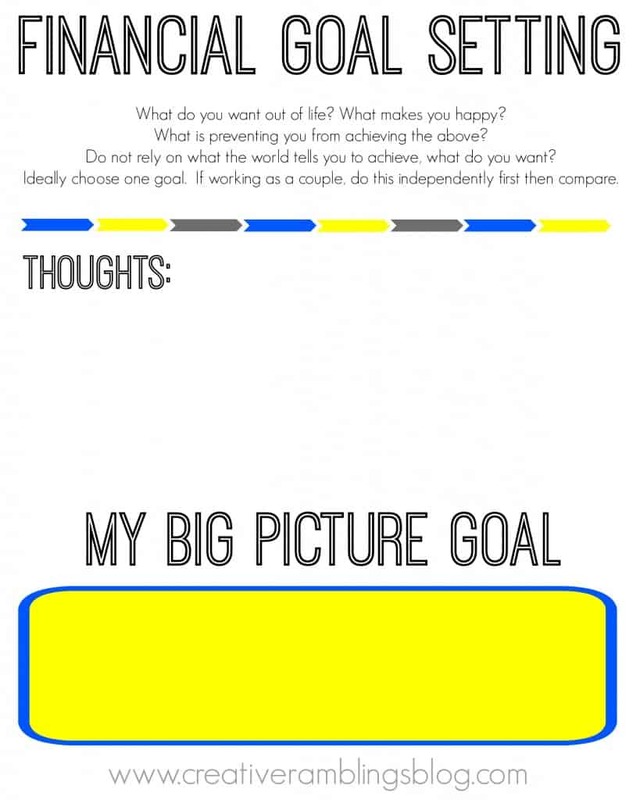 Your Big Picture goal can be a dream, but the steps to get there need to be attainable. What is your dream? Be careful not to let the world define these goals, what do you want? Take time to really define this goal. A big picture goal should be singular, but if you choose to have more than be sure they are something you really truly want out of life. Some examples of big picture goals: Retire at age 55. Pay off all debt. Save enough money to send children to college. If you are goal setting as a couple do this part separately. You can use this worksheet to help you work through the process. Once you have identified your goal (or goals) talk with your spouse. How do you compare? Are you on the same page? Take your individual Big Picture Goals and choose to work on one as a couple, maybe you need to creatively combine goals you have set independently. The next step is setting smaller goals and working toward your Big Picture Goal. Once you have set a goal as a couple it’s time to figure out how to get there. A goal is not attainable without a plan to achieve it. Focus on habits rather than drastic unsustainable measures. I am no expert, but still I am convinced that human beings spend a good bit of our lives on autopilot. Just going through pre-programmed scripts that most people call habits. Focus on identifying those habits which are keeping you from your long-term goals as well as habits you can create to help achieve those goals. Take a month if not two to make a conscious effort to re program yourself and change your habits. If you can do it for a month or two, chances are you will be fine for the long haul. These short-term goals, and the steps you take to achieve them, need to be actionable and trackable. Each month identify 1 or 2 actionable steps you will work on. After the month is up these are likely to become habits. The next month you will continue with your previous month’s habits while identifying new actionable steps. You can use these worksheets to set short-term goals, actionable steps, and to help keep you on track. Here’s an example of a goal I am working on with my husband. We want to pay off our debt by 2020. We are fairly conservative spenders but there is room for improvement. We set short-term goals and actionable steps that focus on curbing our spending in order to put more money toward our debt. There are little things that we truly enjoy as a family that require a few extra bucks. The key is to choose goals and steps that are not so restrictive that we feel deprived and give up all together. Thought process: We need to find ways to have extra money at the end of the month to put toward debt. Short Term Goals: Cut $100 each month in excess spending. Use the extra $100 to pay down debt. Actionable Items: Cut out small extra daily spending. Shop for girls on sale or at the resale shop vs. new brand name clothing. Meal plan each week. Eat out twice or less per month and do it for entertainment not because we forgot to shop or meal plan. Do not take on any more debt. February Steps: Meal plan each week, shop once per week. Go out for ice cream no more than once per week. Goal setting as a couple should be fun and exciting. You should walk away feeling empowered to reach your goal. 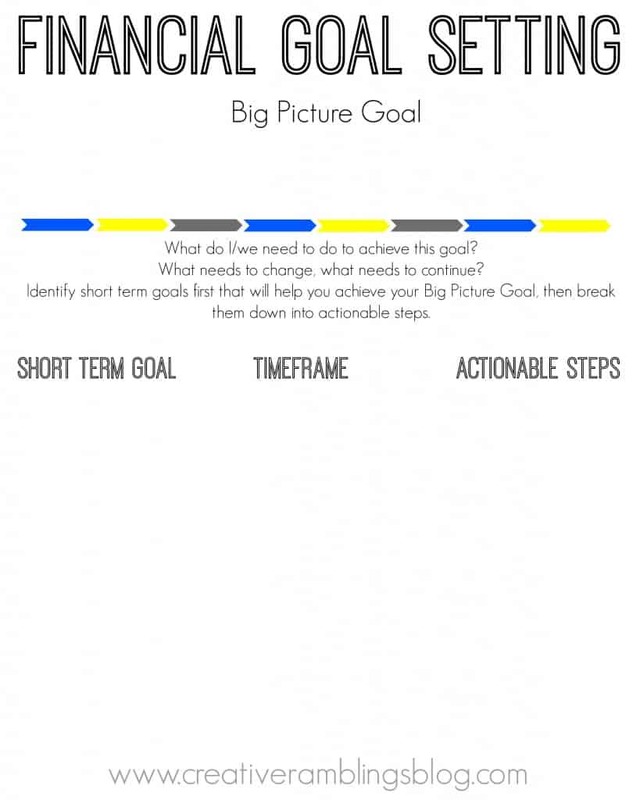 Achieving a Big Picture Goal is all about sustainable habits, work in achievable chunks and you will reach your goal. 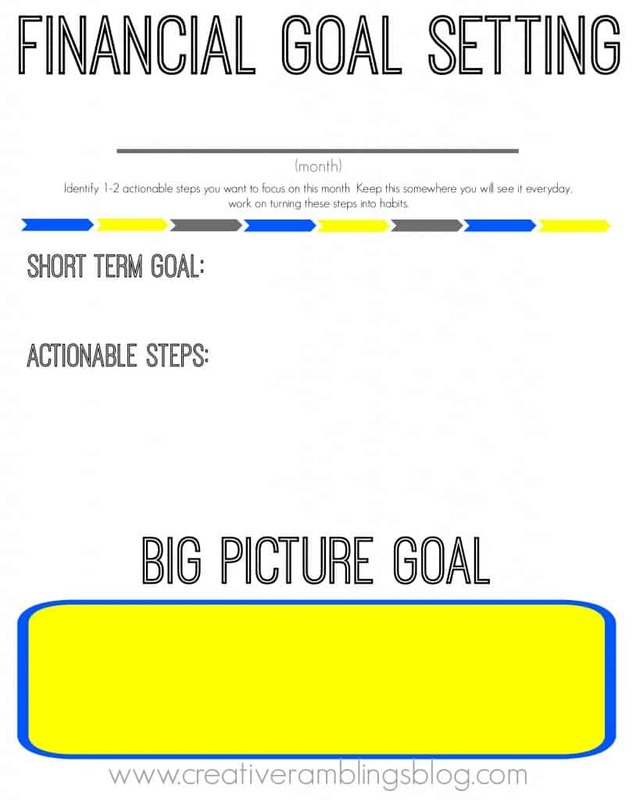 Use these worksheet to identify your goals and work through the steps to achieve them. Have you set goals with your significant other? I’d love to hear how you work on them together. Use these sheets to set some goals and be sure to share with us on Facebook Twitter and Instagram how it’s going. its always surprising to me how many people do not plan for their financial futures. This is a fantastic and very simple idea! I know, for the longest time I just assumed everyone thought about and discussed this type of thing. Thanks for the compliment. You hit the nail on the head, so many of us are on autopilot! These printables are great for planning and sticking to the plan! I like the idea of writing separately and then discussing together! Great tips, thank you. Thanks Jane I really appreciate that. This is great and totally goes hand in hand with DIYing Your Life. I am a huge believer in goal setting and setting both long and short term goals. Thanks so much for the free printables!! You are very welcome, thanks for reading today. Thank you for sharing. I need to download your printables. I’m sharing on pinterest so others can use these wonderful sheets, too. This is perfect! We have been trying to be better with our finances so this couldn’t have come at a better time.